Its been an uneventful week here 🙂 Sometimes those are the best kinds of weeks! Hubs won’t be home this weekend… he’s on what I call a “turn and burn” run up to Michigan. But its ok… I might actually get my fabric organized a little more this weekend! I got some awesome, yummy and FREE coffee from Seattles Best this week 😀 I LOVE #BloggerPerks! Do you love swaps? I do!! I try not to over commit myself, but there is something incredibly fun about getting “Happy Mail”! 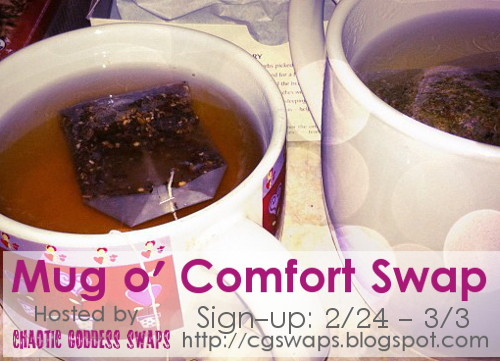 I just signed up for the Chaotic Goddess: Mug O’ Comfort Swap! I love coffee, coffee mugs, and anything related to them! This swap is going to be all kinds of fun! Sign ups are open until Monday, March 3rd … so you better hurry up and join in on the fun! I am absolutely in LOVE with this Ampersand sign from Mary and Martha!!! Pretty sure I NEED it… I don’t know where I’d put it, but I NEED it! 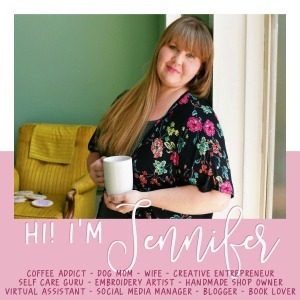 Michelle from Mind of Meesh is talking about some Mommy Guilt! I’m off to work on some new projects and products for the shop! Happy Weekend!! i love that ampersand sign too! i'm kind of addicted to anything that has to do with an ampersand. That mug swap sounds like fun. I may just have to check that out! Those kitties are just too comfy!